If you have a Corvalis/Columbia or have ever flown one you are well aware that is is a "slick" airplane and qualified training is important so you can be comfortable as PIC. I offer the Cessna Factory FITS course in the Columbia, this program consists of 12hrs of ground school and 4-6hrs of flight training. Although it may seem extensive, this is the best way to be very comfortable and proficient in your Corvalis/Columbia. Insurance requirements - Many Corvalis/Columbia owners are aware of the fact that their insurance companies require some form on recurrent training in their airplane. 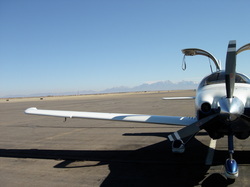 I am a CFAI+ and I can offer recurrent training in your own airplane. Maybe you participated in the Cessna or Columbia approved training course when you purchased your airplane, but you would like to refresh on run through some training again? ...As you are well aware the FAA always likes to distinguish the difference between being "current" and "proficient" as PIC of your airplane. I can offer some of your proficiency training, going over your flight training needs and testing your airplane to its full potential.